Last week I ministered to the family of a teenager who is very close to me, my “Little Brother,” in fact, whose father suffered a long, debilitating illness leading to his death. This was a relatively young man who suffered a lot over the years, in need of an organ transplant he was never able to receive. But in his suffering and dying he showed enormous amounts of strength, grace and dignity, all the same qualities he was known for throughout his life. Jesus said the rain falls on the good and the evil alike, but even Christians struggle with the age-old question of suffering and pain, especially the kind we witness in such good people. 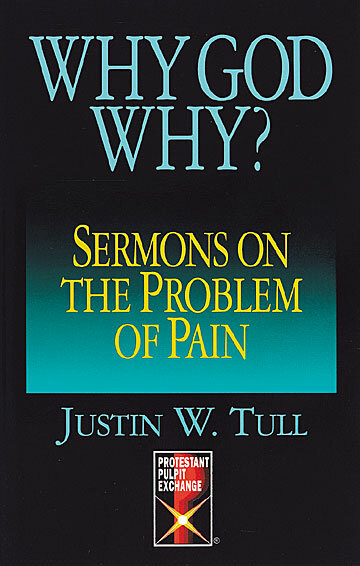 Here’s one take on suffering from Justin W. Tull, a retired United Methodist minister and acquaintance of mine, whose sermons on “the problem of pain” were published in his book, which I recommend, Why God Why? Justin manages to tackle the problem of pain in this book with good humor, and yet in all seriousness. Most of us, if we were given God’s absolute power for a day, would do things differently. Many of us would ensure quick justice. Thieves would have their loot snatched from their hands. Criminals would not have trials but instant punishment, because with divine powers we could determine unmistakably who was guilty and who was innocent. We might even give some reward to those who were nice–perhaps better health, a bonus of some sort. . . Goodness would be instantly rewarded and evil would be readily and firmly punished. And it would be a better world. Several years ago I would have especially enjoyed having supernatural powers. A young man liked to ride his motorcycle with no muffler through the apartment complex where we lived–especially in the middle of the night! . . . He avoided the speed bumps by ridiing through the small gap in the middle that was just wide enough for his small tires. I must confess to fantasizing about putting tacks in that gap or a wire or rope across the road. . . What a thrill it would have been to possess the divine power to yank him off his bike and drop him in the countryside where he would be forced to walk home. If we could be God, we would probably reward goodness and punish evil. But under that system, how could one ever be truly good? If being good were always to our advantage, could we ever really act unselfishly? Could we ever really sacrifice for the good of others? Today, God is still in charge. Yet there is still suffering, even undeserved suffering. How then do we understand God’s role? Is God the instrument of pain or the instrument of comfort? Paul gives us a partial answer to this question in his letter to the church at Corinth: ‘Blessed be the God and Father of our Lord Jesus Christ, the Father of all mercies and the God of all consolation, who consoles us in all our affliction, so that we may be able to console those who are in any affliction with the consolation with which we ourselves are consoled by God’ (2 Cor. 1: 3-4). ﻿I suggest along with Paul that God is not the cause of suffering, but its healer. God is not the creator of pain, but rather the one who hears our cries and offers the presence of the Holy Spirit. God is not constantly slapping our hands, but lovingly offering to walk with us. God is not forever giving out rewards, but instead offers us his guidance through the Spirit and the Word. ﻿﻿By now, surely we have realized that life is not fair. It does not ensure equality. There is no exact justice. Good is neither always immediately rewarded nor evil always conquered. ﻿﻿Our God comes not to give us pain but to be with us in our pain. God comes as our comforter and invites us to be a part of the healing process. We can comfort others as God comforts them. We can offer our prayers, our cards, our food, our presence. We cannot take pain away, but we can help others to bear it. ﻿Christians are not ones who are protected from all pain. Rather, Christians are given an antidote. we are given the presence of God, a presence that can offer us power, spiritual healing, and peace. ﻿Me too, Justin. I know this too. I totally get that, Dave. At what point did Halloween become an excuse for full-grown adults to get all decked out and weird as possible in costumes and get as drunk as last New Year’s date? Isn’t Halloween (which grew out of religious roots, let’s not forget) supposed to be for little kids anyway? Oh well, every day is pretty much Halloween here at JFJ.com, as longtime cultists of the Jitterbug cult know so well. And if you’re new to the blawg, you’ll snap to that soon enough if you keep coming back–it gets a little weird here sometimes. You won’t find any pop music from the gloved one here, as this is a Michael Jackson-, “Thriller” music-free zone, unless you’re wanting to hear thrilling music from Levon Helm, he who drums with a glove (See prior posting for vid of His Greatness Levon and little Sammy Davis and the boys on “Baby Scratch My Back”—which might just be the greatest song ever put to wax (Swamp Blues, Funky & Very Funky Devil’s Music Div., that is). We’re all about that old devil music (and the Texas Rangers, who will get their groove back tonight so stop your Giants fear, people) here at jitterbuggingforjesus.com, the blawg site that is saving the world with its wit, wisdom, provocations and stimulations while possibly (probably) alienating whole towns, cities, nations and states. I’m thinking about putting a spell on yaw so be afraid. 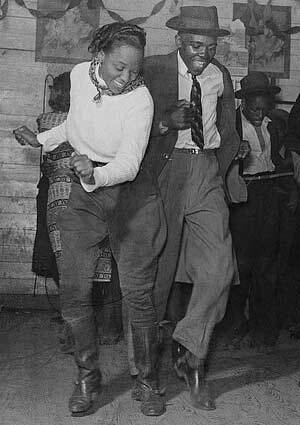 . . . .
How many times did we listen to Slim Harpo swamp blues music on Saturday nights? What else were you to do on a Saturday night in Navasota, Texas? Superb devil’s music . . . . This is one creepy video interpretation of “Beat It” but hey—it’s a creepy time of the year. Aren’t we all walking, talking contradictions? And don’t we all contain layers upon layers of “stuff” piled up from our life experiences? Don’t we all “contain multitudes” within us? We are contradictions, absolutely–though some more than others, and politicians, who contradict themselves in the same sentence more often than not, don’t even count here except to the extent that somewhere beneath their political personas and masks are humans with actual souls (or pieces of souls that have not yet been sold to the devil). We all contradict ourselves, a lot, if only because we have defense mechanisms built into us to protect us from feeling like the fools that we all can be sometimes in life. We all have our “blind spots” that prevent us from seeing ourselves as we truly and genuinely are. We really don’t want to look any too close at ourselves in the mirror because we don’t want to see the parts of us that turn us off about ourselves, the parts that we fear in ourselves, the parts that deep down we know that someone else sees in us so clearly, the parts we know would revolt us if we looked too hard at ourselves. It’s a lot easier and safer just to be walking, talking contradictions sometimes, and that’s our built-in default mode anyway. We dare not even think about how much we contradict ourselves trying to protect our feelings or the feelings of others (even the phony feelings of politicians we think we know so well and who we support so wholeheartedly; but don’t get me started on politicians and all their pissy power and ego trips, please; it’s a sunny day). We all contradict ourselves sometimes because we are, simply put, human. So the best we can do is keep trying to find the deepest part of ourselves, where we were created in the image of God. I’m referring here to that part of us is way down within somewhere, the part covered up by years of life experience with all its hard knocks. As Christians–commanded and obligated to love everyone and his dog–we have to try to find the deepest part of ourselves and every other inhabitant of the globe. 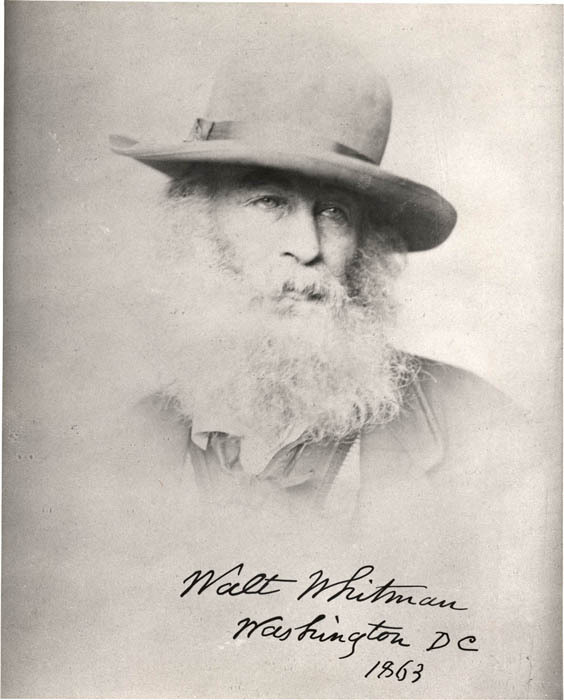 Consider the homeless guy we pass buy and grouse about and dismiss as a drunkard and slackard who ought to get a job, he who looks like Walt Whitman himself. Even the deepest part of that guy is created in the image of God, which means he has a place within him, way down deep, where you can relate to him and engage him and yes, even love him. If only you would. It’s a lot easier to assume you know all about him and his life story and dismiss him as a useless and worthless waste of humanity rather than engage him and learn his life story and, anyway–his story might scare you, which might be why you are so scared of him that you just attack his character (which you know absolutely nothing about) and drive on. That homeless guy (who really does look like Walt Whitman, doesn’t he? )–you might be a few pay checks away from being in his raggedy shoes. And anyway, you two actually have a lot in common, like it or not–you both were created in the image of God; you’re both broken people in desperate need of God’s love and grace and healing power; you both have life stories that, if you are a Christian and had the eyes to see as Christ saw and the ears to hear as Christ heard, could bond you in Christ and Christian love. You are larger than you know or admit; you contain multitudes, you and me both. 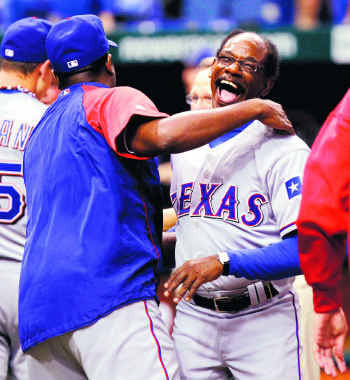 SAN FRANCISCO–Rangers manager Ron Washington basked in his team’s decisive Game 5 win over Tampa Bay in the American League Division Series this month. After a long career as a journeyman player and coach, he now has his team in its first World Series. He was a 54-year-old baseball gypsy then, the Oakland A’s cocksure, cussin’ third base and infield coach. Four years later, he’s a World Series manager. Perhaps that bears repeating, with emphasis on World and Series, as Washington leads the Rangers into Game 1 tonight against the San Francisco Giants at AT&T Park. Seven months and 10 days after he publicly apologized for trying one line of cocaine during the 2009 season, Washington says he is humbled and grateful to have maximized the second chance many believed he didn’t deserve. Washington’s self-belief never wavered. It is culled from 40 years in pro baseball, as player and coach. In many respects, he remains the scrapper who played for nine minor league teams before getting his first full season in the majors, at age 30 in 1982. “I don’t believe in redemption and I don’t believe in payback and all that stuff,” he said. “One thing about Ron Washington is he’s comfortable in his skin. A smiling Washington half-shouted those words last Friday night, above the clamor of 51,000 celebrating fans at Rangers Ballpark in Arlington after Texas’ clinching victory over the Yankees. The hint of defiance in his tone was perhaps intended for media and fans who wanted Washington gone when in his second season at Texas, 2008, the team stumbled to a 7-16 start. Or maybe Washington hadn’t forgotten the sports-radio types who poked fun at his syntax and had a field day with his cocaine admission. Late in his playing career, 1987, he was summoned by his Minnesota Twins general manager, Andy MacPhail. Upon hearing that he had been released, Washington stood, fished a penny from his pocket and smacked it down in front of MacPhail. The “quiet Beatle” was deeply spiritual and serious about the divine and the wisdom and peace to be found in ancient, Old-World religion, and outspoken about phoniness of any kind, but also full of that spirited Beatle wit and whimsy. He was certainly one of the least ego-driven of rock superstars, content to spend days in the quietude and holiness of his famous and beloved English garden. The soaring song “Isn’t it a Pity” is about as melancholy but compelling a piece of music as any ever made. But George’s video for “I Got My Mind Set on You,” is a total hoot, fit for the funny, feel-good song itself. He was the guy who bankrolled Monty Python after all. And here’s two of George’s closest friends–Eric and the late and great Billy Preston (who sings our Jitterbuggingforjesus.com theme song) doing the pity song at the Concert for George memorial (you won’t have any trouble picking out George Harrison’s son on the stage).